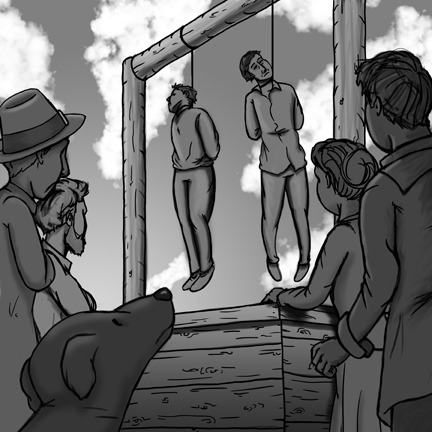 On September 28, 1637, two men convicted on separate counts of murder in the Puritan colony north of Boston — in what is now Essex County — were executed on the same gallows. The first was William Schooler, convicted a year earlier of killing Mary Scholy on the path to Pascataquack; the second was John Williams convicted of killing John Hoddy near Great Pond in Wenham. Original (c) image from Murder And Mayhem in Essex County, used with permission. In the autumn of 1636, an Agawam Indian walking through the Winnacunnet woods, north of the town of Newbury, found the body of a young white woman, lying in a thick swamp about three miles north of the Merrimack river. From the condition of the body, he could tell that the woman had been dead for several months. She lay naked, with her clothing still in a pile not far from the body. The Indian took the news to Newbury, and led the Englishmen to the spot so they could see for themselves. The woman’s name was Mary Sholy. She was identified more by the circumstance than by appearance, since the flesh had begun to rot. Mary had left Newbury several months earlier, traveling north to her home at the English settlement at Pascataquack. The people of Newbury were also fairly certain who had killed her; they believed she had been ravished and murdered by the man she had hired to guide her journey home, an outsider named William Schooler. In London, England, William Schooler had been a vintner with intemperate habits. Schooler was, by his own admission, a common adulterer. After wounding a man in a duel he fled to Holland to escape the law; then, leaving his wife behind, he traveled to New England. In 1636 he was living in a shack by the Merrimack River within the limits of Newbury but outside the boundaries of sanctioned Christian behavior. Mary Sholy, a servant girl, was looking for someone to guide her to Pascataquack, to return to her master. Pascataquack — now Portsmouth, New Hampshire — was a small settlement, about twenty-three miles north of Newbury. It is not known why Mary Sholy had come to Newbury; it is unlikely that her master would have sent her there without providing a guide back. The journey from Newbury to Pascataquack would have been too perilous for a young woman to take alone, first crossing the Merrimack River in a canoe, then following the route to Pascataquack, which was described as little more than a path through the woods. In 1636, even the well-traveled path between Ipswich and Newbury was too narrow for a horse cart. In addition to the possibility of losing her way and becoming hopelessly lost in the woods between the two settlements, there was a very real danger of being attacked by wild animals or hostile Indians. Seeing an opportunity to make a little money, William Schooler sought out Mary and offered to guide her home for fifteen shillings. He did not tell her that he himself had never made the trip to Pascataquack before. Two days after their departure, William Schooler was back in Newbury alone. When asked why he had returned so soon Schooler replied that he had guided Mary to within two or three miles of Pascataquack, where she stopped, saying she would go no further. Schooler left her there and returned to Newbury. The people of Newbury remained suspicious and Schooler was questioned by the magistrates in Ipswich. When he returned from the trip he had blood on his hat and a scratch on his nose the “breadth of a small nail.” He explained that the blood was from a pigeon he had killed and the scratch on his nose was from walking into some brambles. He was released, as there was no evidence then that a crime had been committed. The following year the Pequod tribe took up arms against the English colonists and Schooler was drafted to serve in the militia. He deemed this service to be an oppression and publicly spoke out against it. His outspoken opposition was considered “mutinous and disorderly,” and the governor issued a warrant against him. When he was arrested, Schooler assumed it was about Mary Sholy and began to vehemently defend himself against the charge of her murder. Schooler;s behavior made the magistrates suspicious and, since they now knew Mary Sholy had been murdered, they decided to reopen the case. Newbury residents who knew him came forward to volunteer information on Schooler’s character. In a Puritan court the character of the accused was as important as the physical evidence against him. John Williams was a ship carpenter who had recently come to America from England. In 1637, he was in prison in Boston for theft. Williams and another prisoner, John Hoddy, escaped from the jail and traveled north. They had gone beyond Salem and were on the road to Ipswich, on the east end of the Wenham Great Pond when they had a falling out. The two men had a fight that ended with the death of John Hoddy. There are two versions of what happened next. In one story John Hoddy’s dog held Williams at bay until the noise drew the attention of enough residents of Wenham to apprehend Williams and take him to jail in Ipswich. The more likely story says that Williams took everything belonging to Hoddy, including his clothes, and buried his body under a pile of stones. Williams proceeded to Ipswich where he was apprehended, after having been recognized as a criminal. Though his clothes were bloody when arrested, he would confess to nothing until a week later, when the body of John Hoddy was found. Cows at a farm near Great Pond smelled the blood and made such a “roaring” that they got the attention of the cow keeper, who on investigation found Hoddy’s naked body under a heap of stones. Around the same time the justice of the peace in Ipswich learned that both Williams and Hoddy were escaped prisoners. Williams was indicted for the murder of John Hoddy and tried by the Court of Assistants in Boston. Though he confessed to the murder, the court insisted on enforcing Williams’s right to due process, and tried the case before a jury. Williams was, of course, found guilty and sentenced to death. The double hanging, on September 28, 1637, took place on Boston Common, where all executions in the Massachusetts Bay Colony were held. 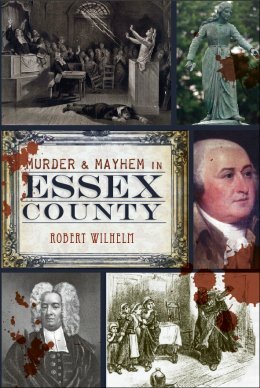 Get Murder and Mayhem in Essex County here.